The first criterion selects a "profile". 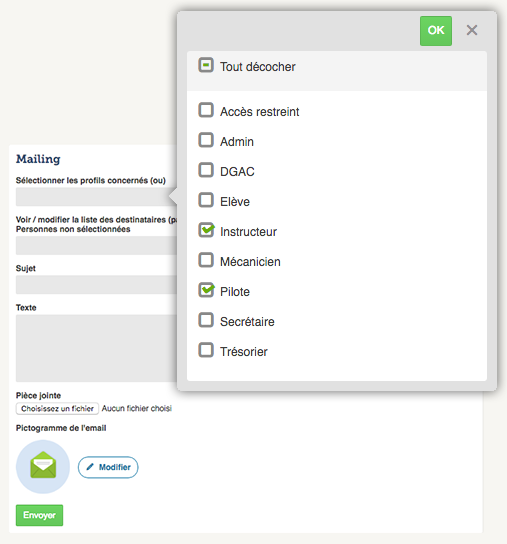 For example, the selection includes all users with the profile "student" or "instructor", some users may belong to two profiles. One can also select multiple profiles. This allows users to select from at least one of the checked profiles. On OF3.6, one can also select by validity, and select users who have or do not have a certain validity. This criterion intersects with the profile profile. Moreover, it is possible to select users individually. If criteria by profile or validity were applied, it removes users from the list of results returned.